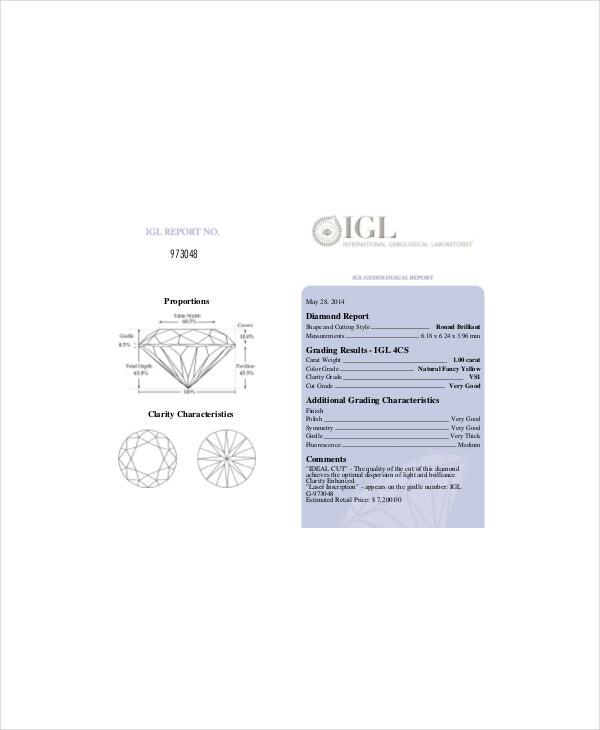 Whenever you need to identify any flaws to a diamond that is under the included and flaws category then diamond grades clarity chart will have you the guide you needed. 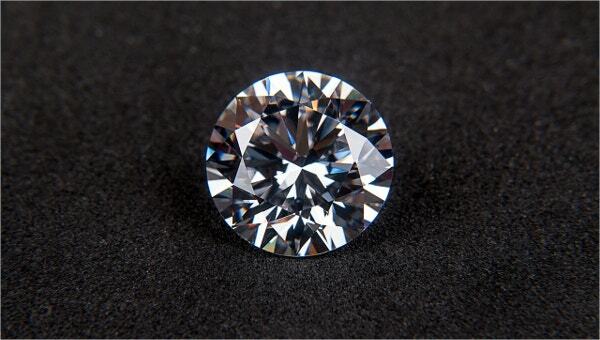 It has the equivalent grade for each imperfection to each category you will see under the magnifying glass that can ease in grading a diamond. 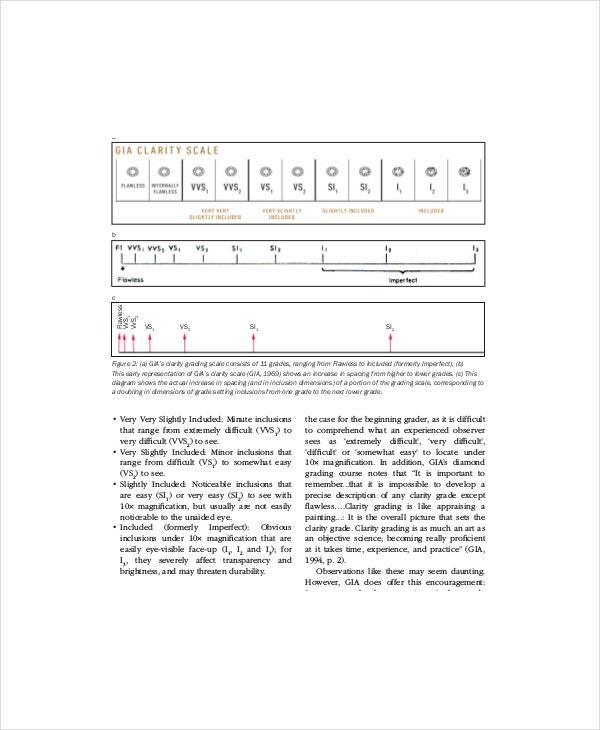 The main parts of these Diamond Clarity Charts is on the clarity part of the diamond grading which is easy to understand and has a great impact on a diamonds value. You must include the carat, cut, color and clarity of a diamond whenever you will grade a diamond in its general appearance. All of the visual appearance of the diamond aided with a magnifying glass or not will be judged with the rule as presented by the Chart Templates making sure that each internal characteristic are properly graded. A teardrop diamond or pear shape diamond will be evaluated well with this chart along with the clarity of it. This chart will show you the bow tie effect or the dark spot like a bow in the central part of the diamond; another is the uneven shoulders where it can be seen in the naked eye along with the bow tie where there is unequal cut in the arc of the diamond. Presence of this two puts any diamond to a decreased value. 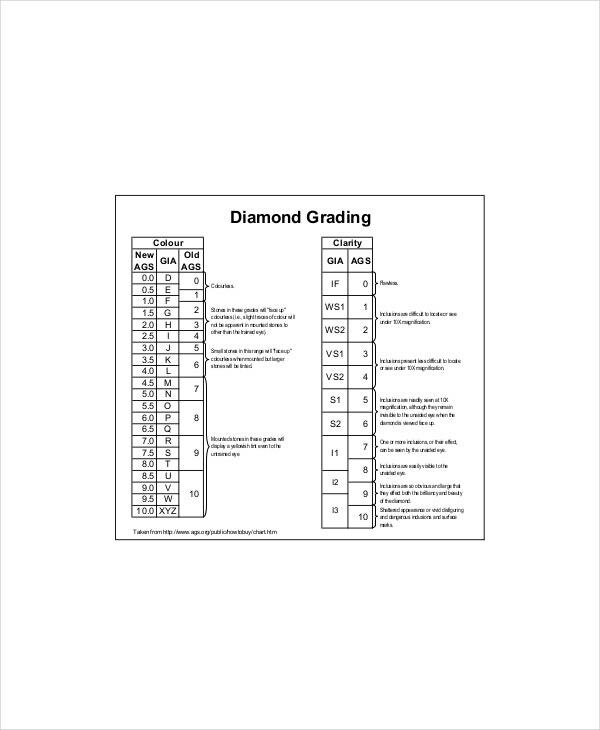 Diamond grades clarity chart in excel can accompany you in formulating an acceptable rate for a diamonds worth with the help of the worksheet. Here you can directly view the characteristics of a diamond where you can compare it to the actual appearance of the diamond under the magnifying glass; with the excel program, you can organize each result you will gain and have the verdict on a diamonds value. With the excel program, it will give you the sheet for each diamond grading you will have. 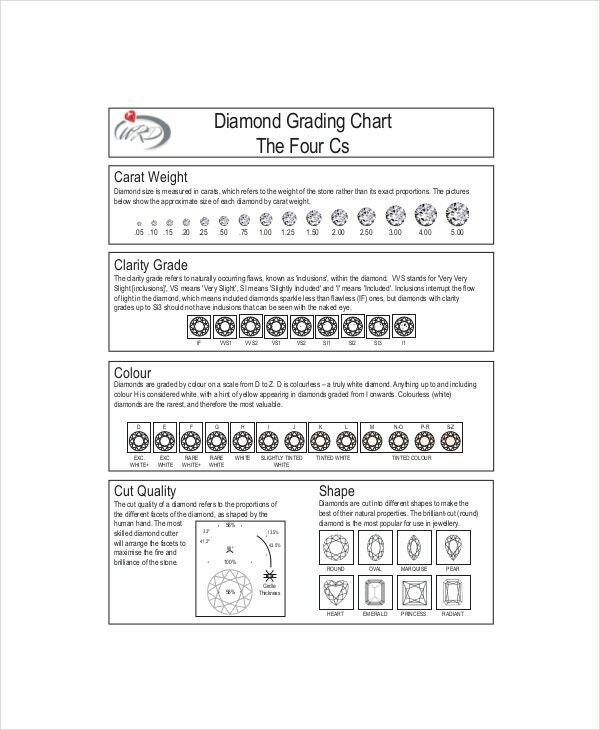 The carat, cut, color and clarity will be divided in each table and sheet that can assist you in rating a diamond based on the assessment done by a jeweler or gemologist; the chart is efficient in all diamond assessments as this can be done in every place as long as you have an internet and a computer or smart phone with you. You can also see Diamond Color and Clarity Chart Templates. If you want to be done in assessing any diamond in just a short time then this chart will be your buddy to have; all of the information you need to take in numerous of examinations you will take can be enclosed in a single sheet with this chart. Any comparable result in the chart is the basis for the final appraisal of any diamond. In the internet today, you can see a lot of data that corresponds to diamond evaluation. All of the data you can see can be compiled in one chart as long as you have a worksheet that can assist you in compiling all of the information you have searched then you can have any modifications you want to it so you can take the chart as your own. You can also see Diamond Color Scale and Clarity Chart Templates. 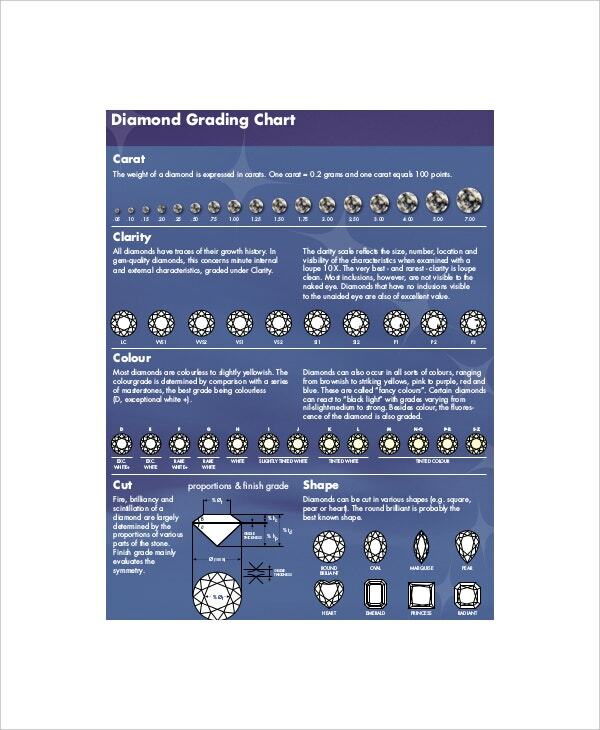 Have the gemological institute of America suggested chart that can help you formulate a better grading to diamond. It will be in compliance to international standard with factual guidelines. The chart can be yours in Microsoft word, excel and pdf file which can be opened in many computers or smart phones today. It will be compatible in many formats for any computer and can be personalized based on the users liking.